After my Ford pump started foaming a year after it was rebuilt I decided to replace it. After much research I decided I wanted to give the Saginaw pump a try. It didn't seem that hard to fit one in our cars. After all the steering box is Saginaw. Note that in my case it is a 351 Cleveland with A/C. I started by researching multiple picture of Saginaw pumps. It happens that while the internals are the same, the inlet and outlet connections vary wildly. I settled with a Stuff Stuff 6184B (https://www.summitracing.com/parts/TFF-6184B). Based on pictures it had connections comparable to the Ford pump. Once I received it I was able to play around with brackets. You can buy brackets specifically to adapt the Saginaw pump to the Cleveland but they are way too expensive. Also, the fact that I have A/C it complicated matters. I decided that I would try using the current bracket with the least modifications as possible. The Saginaw pump has three bolt holes in the front face following a different pattern than the Ford pump. 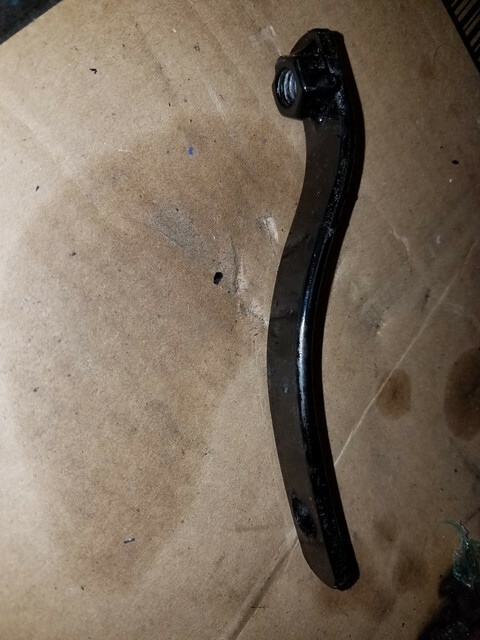 However, it just happens that the two top bolts of the pump match the two bottom bolts of the bracket (lowers the location of the pump in the engine bay). Awesome, so I could adapt the bracket to the pump without major modifications. Even though the pump felt tight with two support points I wanted to add the third. Then came the light. The back side of the pump has another bolt hole for this purpose. Since the OEM bracket has a hole at the rear of the bracket I just needed to bend a thick metal profile to fit within the two. I had some stock 1/8" thick profile about 3/4" wide laying around. This is a bear to bend but with help of the vise and a lot of leverage it ended up being relatively easy. I bent the 1/8" thick metal in a S shape to fit between the pump and bracket. That gave me a very good support for the pump. Then was pulley selection. 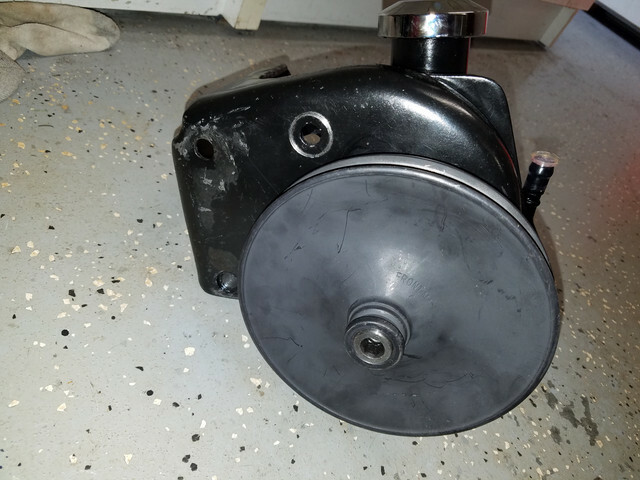 I figured I wanted to find a pulley of similar diameter to the one on the Ford pump. Unfortunately, the shaft diameters are different so I couldn't reuse the OEM one. I also wanted to be able to use the wider belt as the OEM. Most steering pump pulleys were only 3/8", but I wanted to use the 1/2" groove to use the 15 or 17 belts. It took a lot of research and communication with vendors all over the country. At some point I bought a Dorman pulley that had the same diameter but was 3/8" wide. Eventually I found a seller in ebay that listed the OD and width of all the pulleys in stock (hartbroscoreco). 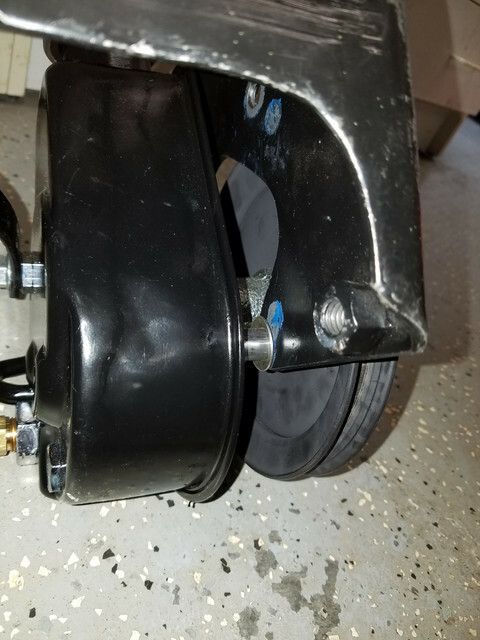 Finally, the power steering pulley for a 1968-72 Oldsmobile Cutlass with a 442 (stamped "MA") had the right dimensions. I don't know anything about Olds but I knew it had the dimensions I was looking for. Once I received it I cleaned and painted. Then it was to figure out the backspacing of the pump with respect to the bracket. The face of the Saginaw pump is further recessed from the pulley than the Ford pump. By measuring the shaft length, pulley and distance to the mating face I figured out the back spacing needed. I cut bushings to this dimensions and installed the bolts. I used washers to finalize the dimensions and made sure the face of the pump was parallel to the bracket. Even though I talked about the S bracket earlier, it was at this point when I bent the bracket. 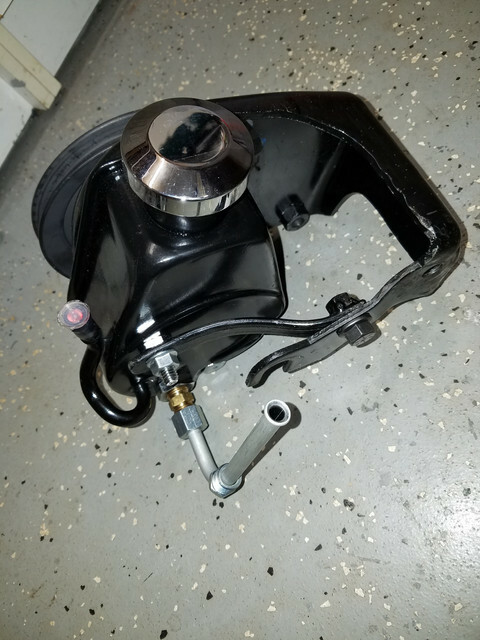 Finally, I had a solidly mounted Saginaw pump to the OEM bracket with the same diameter pulley. I then pressed the pulley and installed in the engine which I had out of the car. The alignment looked very good at this time. The fitting was easy. I needed a 3/8" male flare union (Anderson Metals 704042-06) and Gates elbow tube connection #349760. With the elbow tube tightened to the right angle so it doesn't hit the shock tower I was able to use the stock length pressure hose. The return hose was easy since the tube in the pump was already facing up. The whole pump ends up located lower in the engine bay so the pressure hose is closer to the headers. I covered the elbow tube and pressure hose end with insulation. There is about a 1" gap between the angle tube and the shock tower. The pump belt is also closer to the lower radiator hose, but there is still about a 1" gap. This may vary depending the location of your lower radiator hose. For belt, I needed a slightly longer belt. That was Gates 9530 V-belt. Here are some pictures. I will post pictures of the pump in the car later today. Back side view of pump with S bracket and angle tube. Side view. Note that the two top bolt holes in the pump match the two bottom holes in the bracket. This moves the pump down a little bit. Clarification: the diameter of the pulley is 6.5". Both the OEM and the Olds. Nicely done. Great detail! Finding another 1968-72 Oldsmobile Cutlass with a 442 (stamped "MA") pulley could be a challenge if I were to give it a try. (10-09-2018, 10:08 PM)OzCoupe72 Wrote: Great write up! A removal/installer tool is important to complete the task. Surprisingly, I found out that the Harbor Freight one worked great. (10-10-2018, 07:19 AM)rackerm Wrote: Nicely done. Great detail! Finding another 1968-72 Oldsmobile Cutlass with a 442 (stamped "MA") pulley could be a challenge if I were to give it a try. Agreed. This is definitely the biggest challenge of the project. I think the pump would still work with a pulley slightly bigger or smaller. However, I don't know how much smaller or bigger so that's why I decided to go with the same diameter. A bigger diameter will turn slower, which will rob less HP but may make the steering harder. I don't know the details of flowrate demand and production of the system to have an educated guess of what will happen. There may be other pulleys 6.5" in diameter and 1/2" groove out there that I don't know off. You may be able to make it work with a 3/8" groove. The Dorman 300-122 option is cheap and 3/8" wide. However, I don't know if that will give the belt enough grip to turn the pump and/or water pump. 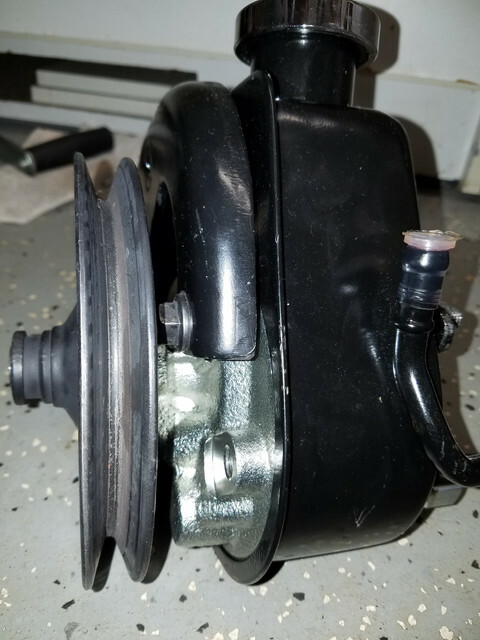 The power steering belt also drives the water pump. I also looked into pulley manufacturers but didn't have much luck. I was also trying to keep pricing reasonable. The pulley I bought was just under $50, which I thought it was already pricey. Manufacturers like March Performance offer some options that may work, but at a higher price. 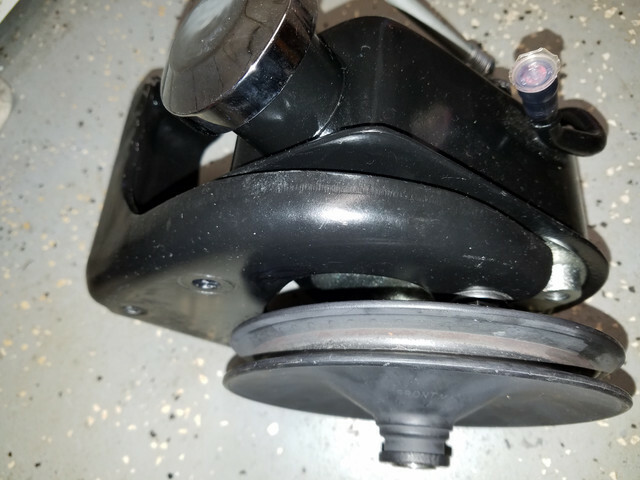 Another issue with pulley selection to keep in mind is if the pulley has the shoulder where you can attach the pulley puller for easy removal. The March Performance, per example, don't seem to have this shoulder. The final issue is the shaft bore. I am hoping that by posting this in the forum someone will come up with a good and cost effective source for a pulley. The offset of the pulley is less critical because you can compensate with the length of the spacer bushing. However, you can't have a negative offset.